HONESTLY!! ... This IS the final update!! Just got another note from Robert Gordon University saying - "The pelican feeding its young was adopted as a symbol by the Hospital to illustrate Robert Gordon's charity and sacrifice of his wealth for the sake of the younger generation". Bravo Bob! Love the thimble too! Bob, Brilliant to see the updates and the photo of the boy in the uniform of that time. This is some story - a button worn by a Robert Gordon's Hospital student, eventually lost near Stracathro, found by you over a hundred years later and then recognised by a Robert Gordon's College student after your post. Good to see Jim's button too. Robert Burns' line 'I wadna gie a button for her!' from 'Sic a wife as Willie had' came to mind, although in this case the buttons and the detective work deserve a toast! 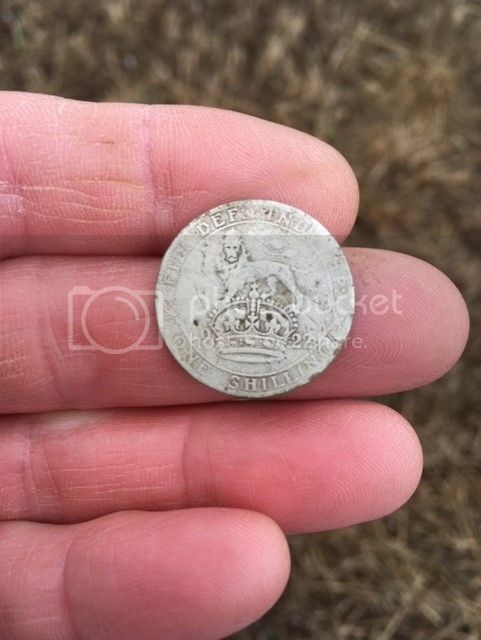 Trying to upload a picture of the 1922 Shilling, found at Stracathro, to the site from Photobucket? This is the link but I thought the photo would appear and not the link?